Welcome to 2016! The glitter ball has dropped at the Space Unicorn Rangers Corps Space Station of Squee, and we’ve welcomed a new year filled with friends, family, fun, compassion, and art. We’re writing this editorial after yet another magnificent Chicago TARDIS convention. We’ve been attending since the first one in 2000 and have managed 14 in total. Caitlin’s experiences with Lis Sladen and Colin Baker back in 2008 were the emotional core of Lynne’s Chicks Dig Time Lords essay. You can literally watch Caitlin grow up in the photos of her with Doctor Who actors. Basically, every year at Chicago TARDIS has felt like another Make–A–Wish trip for Caitlin. This year was no exception. Actors Alex Kingston, Ingrid Oliver, and Katy Manning all made sure to talk to Caitlin and make her feel special. We also had a groovy Uncanny Magazine staff dinner with Steven Schapansky, Erika Ensign, Michi Trota, and their loved ones. It was a glorious and relaxing weekend. One of the reasons this convention is such a joy for us is Chicago TARDIS and its staff are very attentive to accessibility. It’s held in a hotel built in the last ten years, and they have trained staff members and procedures, so people with disabilities have the same opportunities for a marvelous time as everybody else at the convention. We go to a ton of conventions for work, and, sadly, this isn’t always the case. Many excellent conventions are addressing accessibility at their events, and improving every year, which we absolutely applaud and appreciate. Others have resisted, even though it’s both the right thing to do and a US federal law thanks to the Americans with Disabilities Act. After some recent conventions had some major failures with their accessibility again, we and Mary Robinette Kowal—with help from many others—felt it was necessary to create an SF/F Convention Accessibility Pledge, similar to the John Scalzi pledge about not attending conventions without harassment policies. Hundreds have signed the pledge, and it has also been covered by io9. Most importantly, we’re seeing many convention staff members joining together to share information and work to make their conventions more accessible. That’s awesome, and frankly, the point of the whole thing. Fandom is for everyone, including people with disabilities. Speaking of conventions, soon the Thomases will be attending ConFusion in Detroit. We predict massive shenanigans with our friends, colleagues, and readers, probably involving cookies with or without raisins. We hope to see all of you there. As you probably know from numerous blog posts around the web by many creators, SF/F awards season has begun. We’re listing all of the eligible Uncanny Magazine works on our blog, classified by length. If you’re unsure whether a story you loved was from 2015, or if it’s a short story or novelette, this is the place to look. We are truly proud of everything we published in 2015. Considering this is the first full year of Uncanny, we think it’s been pretty damned spectacular. Thank you so much for reading or listening to the wonderful stories, poems, and essays we’ve been so pleased to share. The generosity of the Space Unicorn Ranger Corps through Kickstarter, Weightless Books and Amazon subscriptions, and Patreon makes paying our creators and staff possible. Please keep spreading the word and encourag-ing others to join the ranks. We’re always looking for more recruits! 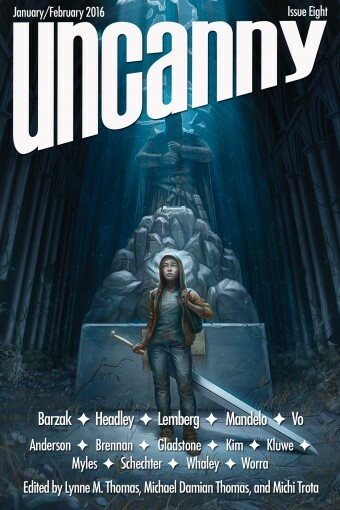 Uncanny Magazine 2016 kicks off with a wonderful cover by Priscilla H. Kim, “Round Three.” Our new fiction features Maria Dahvana Headley’s twisted and gorgeous novelette, “The Virgin Played Bass,” Nghi Vo’s haunting and powerful “Lotus Face and the Fox,” Christopher Barzak’s incisive retelling of a classic gothic story, “The Creeping Women,” Brit Mandelo’s sharp and sensual “The Sincerity Game,” and Rose Lemberg’s charming and hopeful “The Desert Glassmaker and the Jeweler of Berevyar.” Our reprint this month is Sarah Rees Brennan’s clever and fun “The Spy Who Never Grew Up,” originally published in Kiss Me Deadly: 13 Tales of Paranormal Love. Our essays this month feature Chris Kluwe discussing the false divides and ridiculous gatekeeping between sports and geekery, Max Gladstone examining the impact of Star Wars on SF/F culture and art, Isabel Schechter talking about how to make SF/F conventions more welcoming to people of color, and L.M. Myles discovering that her SF/F grandmother is author Naomi Mitchison. Our poetry includes Kayla Whaley’s stunning “tended, tangled, and veined,” Leslie J. Anderson’s beautiful “The Exquisite Banality of Space,” and Bryan Thao Worra’s piercing “Narrative of the Naga’s Heirs.” Finally, Deborah Stanish interviews Maria Dahvana Headley and Christopher Barzak about their stories. Podcast 8A features Erika Ensign reading Nghi Vo’s “Lotus Face and the Fox,” Amal El–Mohtar reading Kayla Whaley’s poem “tended, tangled, and veined,” and Deborah Stanish interviewing Nghi Vo. Podcast 8B features Amal El–Mohtar reading Brit Mandelo’s “The Sincerity Game,” Erika Ensign reading Bryan Thao Worra’s poem “Narrative of the Naga’s Heirs,” and Deborah Stanish interviewing Brit Mandelo. Please enjoy the latest issue of Uncanny Magazine, and thank you all so much for your continued support.